Gregory Oliver Hines fue un actor, cantante, bailarín y coreógrafo estadounidense. Los Ángeles (California), EE. UU. Nació en Nueva York el 14 de febrero de 1946 y falleció en Los Ángeles el 9 de agosto de 2003. Hines y su hermano mayor Maurice empezaron a bailar siendo muy niños. Estudiaron con el coreógrafo Henry LeTang. Junto con su padre, los tres fueron conocidos como los "The Hines Kids" y más tarde como "The Hines Brothers". En 1963 cambiaron otra vez de nombre: "Hines, Hines and Dad". Hines apareció en películas como The Cotton Club, White Nights, Running Scared, Tap y Waiting to Exhale. En televisión, protagonizó su propia serie en 1997, llamada The Gregory Hines Show. También apareció en un rol recurrente en Will & Grace como Ben Doucette. Hines hizo su debut en Broadway con su hermano en The Girl in Pink Tights en 1954. Ganó nominaciones al premio Tony Award por Eubie! (1979), Comin' Uptown (1980) y Sophisticated Ladies (1981). Ganó el premio Tony y el Drama Desk Award por Jelly's Last Jam (1992) y ganó el Theatre World Award por Eubie!. Está enterrado en el cementerio Saint Volodymyr's Ukrainian Catholic Cemetery, en Oakville (Ontario). 1979: Theatre World Award: Eubie! 1979: Tony Award for Best Featured Actor in a Musical: Eubie! 1981: History of the World: Part I. 1983: Deal of the Century. 1984: The Muppets Take Manhattan. 1985: Faerie Tale Theatre: "Puss in Boots". 1991: Eve of Destruction (film). 1991: A Rage in Harlem. 1997: Subway Stories: Tales From the Underground. 1990: Things You Can Tell Just by Looking at Her. 2000: Once in the Life. 2000: Will & Grace (TV). 2002: Venice: Lost and Found. 2004: Keeping Time: The Life, Music & Photography of Milt Hinton. ↑ Billboard.com (historial de Luther Vandross). ↑ Mervyn Rothstein (1 de septiembre de 1992). «The Man in the Dancing Shoes». cigaraficionado. Archivado desde el original el 8 de octubre de 2009. Consultado el 9 de junio de 2008. ↑ Jr. news (1992). «Gregory Hines Interview». sammydavis-jr. The Sammy Davis, Jr. Association. Consultado el 9 de junio de 2008. ↑ Jennifer Dunning (11 de agosto de 2003). 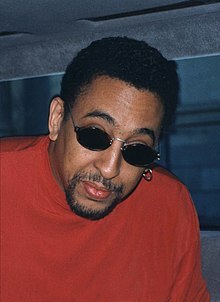 «Gregory Hines, Versatile Dancer and Actor, Dies at 57». The New York Times. Consultado el 9 de junio de 2008. IMDB.com (Hines en la Base de Datos de Películas en Internet). TonyAwards.com (entrevista a Greg Hines). VillageVoice.com (Tapping into history, por Deborah Jowitt, agosto de 2003).